Final Fantasy Tactics GBA Game Boy Advance Game Cartridge Cleaned Tested and Guaranteed to Work! When I first bought the game, it would not allow me to save my data over the previous owner’s (it froze up!). I emailed customer service and they replied right away! They sent another game to me automatically, with no extra charge, and I didn’t even have to send the broken one back. The new game works perfectly! Exactly how I remembered it as a kid. Game arrived in great condition! The label was showing a little wear, but that's to be expected. Game runs smoothly and has been fun to play! Fantastic game which arrived in perfect working condition. It’s exactly what I wanted and working perfect! I was skeptical at first when looking online. I was hoping to find an actual official game and not just some repro cart. Glad to see when it finally arrived, (which was very timely) was an authentic game with old saves on it! Works fantastic, I haven't had any issues with it. I am definitely going to be making my future GBA purchases from Lukie Games in the future! Not being used to strategy games , in the beginning , I thought: This game is weird, what's the objective? But I played my first battle , and it was fun. 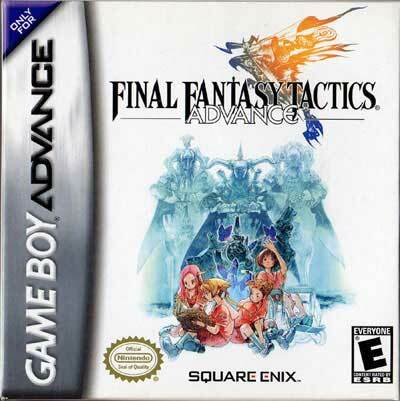 Its was like a chess game with final fantasy advance. I will definitely continue playing it! 5 stars!! One of the greatest turn-based strategy games I've ever played. The introduction of the judge system took a little getting used to, and often made battles very difficult and challenging. Best thing about this game is the quick-save feature, so you can pick it up, make a few moves, then go back to what you're doing.